Since 1986, Crossroads has been a close partner with Philippine Study Group of Minnesota (PSGM), an educational group that brings concise analysis of current developments in the Philippines to the Twin Cities. PSGM is in turn a close partner with the Filipino-American community of Minnesota. For more information, please contact the Philippine Study Group of Minnesota. Since 1994, the Minnesota Filipino-American community had campaigned to correct an historically inaccurate and racially sensitive plaque that hangs in the Minnesota State Capitol. 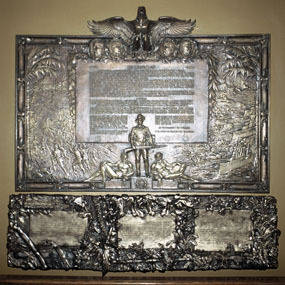 The plaque commemorates the role of Minnesota in the Philippine American War (1899-1902). Unfortunately, the plaque has several historical facts wrong, and uses language that is offensive to Filipinos. 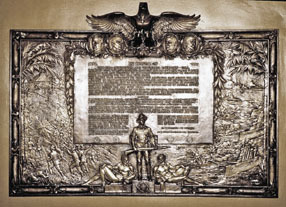 After intensive efforts, the Philippine Study Group of Minnesota in 2002 convinced the state to install a bronze plaque correcting the inaccuracies. This plaque, designed by Duluth artist Ann Klefstad, was installed at a special ceremony on Monday, February 4, 2002, in the state Capitol Rotunda. The new plaque was installed by the Philippine Study Group of Minnesota, the Capitol Area Architectural Planning Board, the Minnesota Historical Society, and the Minnesota Department of Administration, using a $10,000 appropriation from the Minnesota legislature. This event marked the first time in U.S. history that an historic plaque concerning the Philippine American War has been corrected by a state. More about the unveiling ceremonies. List of Speakers at February 4 unveiling of the corrective plaque. Letter from the Philippine Embassy confirming that Ambassador Del Rosario will attend the unveiling. Historic letters from Minnesota soldiers who were horrified at their role in the Philippines. Comments by the Minnesota Adjutant General about the need to correct the old plaque. Statement of Dr. Michael Cullinane calling for a national campaign to correct other such commemoratives in the U.S. Cullinane teaches at the University of Wisconsin. Praise from historian James Loewen including his critique that the plaque does not do enough to correct the historical record. Loewen is the author of Lies My Teacher Told Me . Statement of historian Kyle Ward acclaiming the new plaque as a commemoration of the 13th Minnesota and their role in the Philippine War. Ward teaches at Vincennes University. James Loewen, Lies Across America , The New Press (1999). Chapter 25, “Serving the Cause of Humanity” (pages 136-143; imaged with permission). Loewen is also the author of the acclaimed book, Lies My Teacher Taught Me . Kyle Ward, In the Shadow of Glory: the 13th Minnesota in the Spanish American and Philippine American Wars, 1898-1899 , St. Cloud: Northstar Press (2000). Chapter 10, “Will Live in History” (pages 141-145; imaged with permission). Prof. Ward teaches Social Science at Vincennes University. “How the Philippines became the first colony of the United States” Historical sketch by Tito Sumangil. For further information, please contact the Philippine Study Group of Minnesota.